Reacting to yesterdays demand by Chief Minister B S Yeddyurappa seeking an apology, the Governor of Karnataka, H R Bharadwaj has made it clear that a request for prosecution cannot be ignored in the interest of democratic principles. The Governor of Karnataka wrote back to the Chief Minister in the light of a Cabinet decision which requested the Governor not to grant sanction for prosecution of the Chief Minister and the Home Minister in connection with a land scam. Two lawyers had petitioned the Governor seeking action against Chief Minister, B S Yeddyurappa and Home Minister, R Ashok in connection with a land scam. The governor had said that he was looking into this and if there was enough material he would sanction the prosecution of both the leaders. However the Cabinet had met and wrote back to the Governor saying that it would be unwarranted for him to order the prosecution of the CM and the Home Minister. They also pointed out that the government had already set up a commission to look into the issue of land scams and hence the Governor’s actions would be unwarranted. However the letter by the Cabinet has had very little effect on the governor. He has written back to the Chief Minister stating that in the interest of the democratic principles he cannot ignore the request for prosecution. I am required to and also entitled to an independent decision on the basis of the material provided to me. Hence a Cabinet decision recommending that I drop proceedings is completely unwarranted. The war of words is expected to continue since the Yeddyurappa camp is no mood to tone down. They are stepping up the pressure against the Governor and will seek his removal. In this regard they would be meeting with the President of India on January 24th. In addition to this the CM has also said that that the Governor should aplogise for his remarks in which he referred to Yeddyurappa as a thief. The Core committee of the BJP in Karnataka is also meeting to discuss this issue further. You are aware, allegations relating to land scams, corruption and manipulation of rules and regulations regarding acquisition and denotifying of public lands regularly appeared in the media since September, 2010. Allegations of serious nature of corruption were leveled against the high office of the Chief Minister of the State by various groups, which delivered representations to me personally, thus creating a cloud on your personal integrity. You will recall that I addressed the letter of 15.12.2010 seeking factual information from you on the allegations levelled against you. In your reply dated 19.12.2010, you furnished no details and simply stated that the allegations were politically motivated and without any basis. However, you informed me that cases relating to land scams have been referred to a Commission of Inquiry headed by Justice Padmaraj, a retired Judge of the High Court. On 28.12.2010, two Advocates namely Shri Sirajin Basha and Shri K.N.Balaraj came to Raj Bhavan with the petition that the land scams involving the Chief Minister are not being allowed to be investigated by the investigating agencies and even the Lokayukta Police refused to accept their complaint. Therefore, they intended to file a complaint before the designated Special Court and that they need a sanction to prosecute the Chief Minister and Home Minister. They also delivered large volumes of documents in support of their allegations. When you visited Raj Bhavan for a courtesy call on 31.12.2010, I informed you of the receipt of this petition from the Advocates and during the discussion I informed you that this will have to be disposed of expeditiously and this cannot be kept pending indefinitely. With your letter dated 19.01.2011, you sent to me a Cabinet decision dated 19.01.2011. The sum and substance of the Cabinet decision is it simply requires me to put a lid on the serious allegations of corruption against you. In this connection, I draw your attention to the dictum of the Supreme Court of India in M.P.Special Police Establishment vs. State of M.P. (2004) 8 SCC 788 wherein the Court held. If on these facts and circumstances, the Governor cannot act in his own discretion there would be a complete breakdown of Rule of Law in as much as it would then be open for Governments to refuse sanction in spite of overwhelming material showing that a prima-facie case is made out. If, in cases where prima-facie case is clearly made out, sanction to prosecute high functionaries is refused or withheld, democracy itself will be at stake. It would then lead to a situation where people in power may break the Law with impunity safe in the knowledge they will not be prosecuted as the requisite sanction will not be granted”. In the light of the above judgment, the Governor is entitled to and required to take an independent decision on the basis of the material available and therefore the Cabinet decision recommending to drop the consideration of the petition itself is unwarranted. 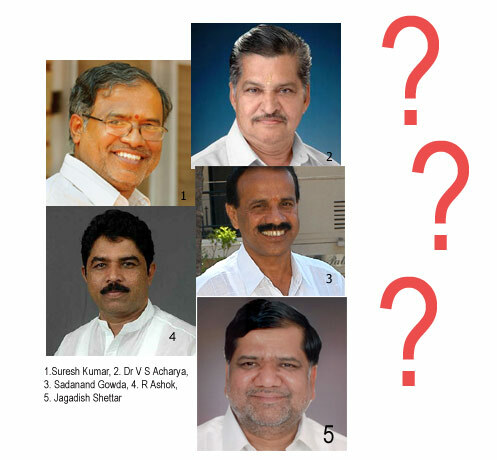 Who should replace Yeddyurappa? Tell us. 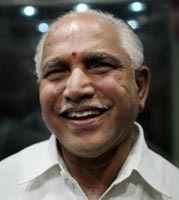 Author Vicky NanjappaPosted on December 1, 2010 February 22, 2012 Categories Karnataka PoliticsTags Vicky Nanjappa, Yeddyurappa125 Comments on Who should replace Yeddyurappa? Tell us. The Supreme Court of India on Tuesday ordered issuance of notices to the Karnataka Chief Minister, B S Yeddyurappa among others on a petition challenging his decision to disqualify seven MLAs from the assembly. The Supreme Court also issued notices to Speaker of the Karnataka Legislative Assembly, K G Bopaiah who had passed the order of disqualification before the crucial trust vote which the BJP government in Karnataka faced a month back. Seven MLAs who were disqualified and were not permitted to vote had first approached the High Court and after they failed to obtain a favorable order, they moved the Supreme Court of India seeking a reversal of the High Court order. When everyone thought that it was the end of Karnataka Chief Minister, B S Yeddyurappa, he managed to pull it off yet again. Yeddyurappa ever since he led the first BJP to victory to form its first government in South India has almost lost his chair on at least four occasions, but each time he managed to pull it off. This time however the entire state thought he would have to go and when he constantly dodged the high command, which is believed to have sought his resignation even some of his cabinet colleagues thought that he was on his way out. There sure has been a hard bargain and at the end of it Yeddyurappa managed to win the game with the high command. Now what is it that made the high command tow Yeddyurappa’s line despite being so sure a couple of days that the Chief Minister had to be replaced at any cost. Yeddyurappa who dodged the high command for nearly a week first sent his emissaries to New Delhi to talk with the high command. During the first round of talks the high command was not impressed and continued to tell his emissaries that there was no way that they could let him continue when there were so many serious charges against him. However the emissaries then convinced the high command that he should be permitted to stay on till December at least since the Zilla Panchayat elections were round the corner and a change of guard could lead to an embarrassing result in the polls. At this point of time, the high command said that it was important that the man himself is present in New Delhi and he should be talking to them directly. Yeddyurappa who was in Puttaparthi at that point of time decided to fly into New Delhi and hold talks with the leader of his party. From day one it was evident that Yeddyurappa would not give up without a fight. He constantly reminded the high command that they could take such a decision based on allegations made by the opposition. The job of the opposition is to make allegations and they are constantly trying to bring down the government and the high command should not yield to that. In addition to this, Yeddyurappa also summoned his close aides (both MPs and MLAs) and held a parliamentary board meeting in which he managed to get the support of all them. This was also conveyed to the high command and the CM told them that the high command could not take a decision when his MLAs rallied behind him. Although all his MLAs were not present, the fact that none of them made any noise back in Karnataka also worked in his advantage. The Reddy faction which has been gunning for his head for quite sometime also realised that any move against Yeddyurappa could prove fatal to the government and there were in no position to lose power in Karnataka at this moment at least. In addition to this, Yeddyurappa also managed to get some pressure on the high command through the religious leaders and also some RSS leaders in Karnataka. The religious leaders who have a major say in Karnataka’s vote bank went a step ahead and some of them even threatened to burn down the state if Yeddyurappa was replaced. The high command to an extent resisted all these threats and explanations. They felt that it would be better to have another round of talks with Yeddyurappa and this is when he decided to talk tough. 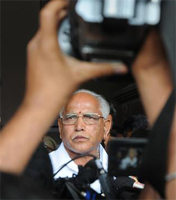 Yeddyurappa while speaking of the charges against him also said, “these are charges which have not been proven as yet. There is a commission of inquiry that I have set up. I wont wait for the verdict of the commission which may take a long time. Whether I am guilty or not will be proved in the Zilla Panchayat elections which are to be held in December. Let me seek justice before the people and if they elect the BJP then that would prove everything. However if the people feel that I am incapable and I am at fault then they will not vote for me. In such an event I wont wait for the high command decision, I will step aside gracefully. In addition to this, Yeddyurappa landed in New Delhi with reams of documents. These were all documents of scams against former Chief Ministers, Dharam Singh and S M Krishna. There are charges which are worse against them and they were not asked to quit since their high command felt that the charges were not proved. Why are you meting out a separate treatment for me,” Yeddyurappa also questioned the high command which finally gave in and let him continue as the CM of Karnataka. Will the stalemate end today? The Stalemate Continues in New Delhi over the fate of Karnataka Chief Minister B S Yeddyurappa. He was scheduled to meet with Nithin Gadkari today. 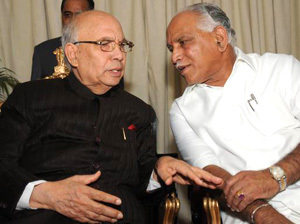 However news now trickling in suggests that both the High Command and Yeddy have not been able to come sort out the issue and the stalemate continues. Yeddyurappa has been camping in New Delhi since yesterday along with his loyalists. Until something concrete comes out, read below how the two days have shaped out. B S Yeddyurappa who is scheduled to meet BJP chief Nitin Gadkari in a few hours from now received the support of a majority of the MP’s from his party. During the parliamentry board meeting held at new delhi a majority of the BJP MPs and MLAs pledged their support to Yeddyurappa. The meeting discussed the course of action that needed to follow in the wake of corruption charges against the CM of Karnataka. Majority of the leaders were of the opinion that he should continue as the cm of karnataka. Meanwhile all eyes are on the Gadkari- Yeddyurappa meeting which will be held in a short while from now. During the meeting the minutes of the meeting will be placed before Gadkari who just returned to Delhi from Nagpur. It appears that Chief Minister of Karnataka, B S Yeddyurappa will be given a fresh lease of life and the high command may just let him continue. Dr V S Acharya, cabinet minister in the Yeddyurappa government told rediff.com from New Delhi that the high command has almost come to a decision to permit Yeddyurappa to continue as the Chief Minister of Karnataka. He further added that there is no other alternative and more importantly not once has anyone in the high command said that they wanted his resignation. He will be allowed to continue in office and a question that I am dying to ask the media is who has been giving all of you information that Yeddyurappa has been asked to step down. At the moment he is meeting with other central leaders and once Nithin Gadkari, the BJP chief returns to New Delhi, he will meet with him and the official announcement will be made, Dr Acharya also said. Meanwhile BJP senior leader, Venkaiah Naidu said in New Delhi that there has been no defiance on part of the Karnataka Chief Minister. He said that the whatever decision that the high command takes, Yeddyurappa would abide by it. A meeting will be held of all party leaders in which Yeddyurappa too would be present and a final call will be taken on the matter, he also said. Yeddyurappa too echoed the same view as Naidu and pointed out that he is no defiance mode and would abide by the high command. I will listen to the high command and obey whatever they have to say about me, the Chief Minister also said. I will put forth my stand before them and also tell them I have committed no mistake. Also I want to say that no one has till date asked for my resignation. BJP chief, Nitin Gadkari, in a statement issued at Nagpur said that he would return to New Delhi on Tuesday and the fate of Karnataka Chief Minister, B S Yeddyurappa would be decided. He said that he would hold talks with the Karnataka CM following which a final decision would be taken. Meanwhile, Yeddyurappa who met with Arun Jaitley seemed surprisingly upbeat and said the talks with the BJP leader went very well. We discussed at length the development of the party in Karnataka and i was happy with the manner in which the discussions went. He however said that he would not respond to any speculation regarding his resignation and did not divulge whether the issue came up during his meeting with Jaitley. Yeddyurappa said that he would stay on at New Delhi for two more days and return to Bangalore once the crisis is over, which he said he was hopeful would be over soon. Meanwhile a lot of religious institutions in Karnataka are stepping up the ante in support of Yeddyurappa. In several statements issued by them, the religious leaders say that the state would burn if the CM is replaced. They have also urged the high command not to act in haste and change the Chief Minister. Close on the heels of B S Yeddyurappa refusing to step down, BJP party chief Nithin Gadkari who was supposed to hold talks in this regard has left for Nagpur. Gadkari who was authorized to take a decision on Yeddyurappa took the 6.45 flight out of Delhi to Nagpur. Gadkari was supposed to meet with Yedyurappa and decide on the formers fate left just hours before the meeting could be held. He will return to New Delhi on Tuesday. Meanwhile Yeddyurappa will held a second round of talks with Arun Jaitley in a few minutes from now. Yeddyurappa has also been meeting with some of his cabinet colleagues who had gone to Delhi to support him. Karnataka Chief Minister, B S Yeddyurappa has decided to take the fight with the high command further and has now said at New Delhi that no one has asked him to resign. When this is the case there is no question of me tendering my resignation, he said in New Delhi a while ago. Yeddyurappa who held a meeting with BJP leader, Arun Jaitley also conveyed the same to him and said that the question of his resignation does not arise. He will now meet with leaders from Karnataka who have flown down to Delhi to support him and later would meet with Nithin Gadkari, BJP chief. Some observers point out that the whole problem is that despite a core committee decision of the BJP central leadership, the party has not made any formal announcement asking Yeddyurappa to quit as yet. Dr V S Acharya, senior cabinet minister from Karnataka told rediff.com that Chief Minister of Karnataka is currently locked in a meeting with senior BJP leader Arun Jaitley. Dr Acharya who is in New Delhi at the moment to hold talks with the high command said that from the airport, Yeddyurappa headed straight to the Karnataka Bhavan and then set out to meet with Jaitley. Denying Television reports that Yeddyurappa had gone missing, Acharya also added that following the meeting with Jaitley, he would return to Karnataka Bhavan following which he would hold a meeting with Gadkari. Yeddyurappa currently is discussing his stance on the resignation with Jaitley who was in charge of Karnataka at the time the elections were held in the state. Ahead of the crucial meeting between B S Yeddyurappa and the party high command in New Delhi, the government in Karnataka has issued a notification appointing former High Court judge, B Padmaraj as head of the commission which will probe the land scam of ten years including the one against the Chief Minister and his relatives. A notification to this effect was issued a while ago appointing Justice B Padmaraj who was also heading the Railways Tribunal. The Chief Minister who is facing allegations of a land scam had ordered an inquiry just ahead of the high command pressurizing him to step down a week ago. This commission will probe all the land scams of the past ten years and would include the latest one involving the Chief Minister as well. Meanwhile in New Delhi, Yeddyurappa headed straight to the Karnataka Bhavan following his arrival from Puttaparthi. He will stay there a while and then head out to meet party chief Nithin Gadkari. The Congress leaders in Karataka will call on Governor of Karnataka H R Bharadwaj later today and seek his intervention in the wake of the administration of the state collapsing due to the B S Yeddyurappa crisis. The delegation will be led by Congress chief Parameshwar who will submit a memorandum to the governor to this effect. In the memorandum they have said that action ought to be taken since the administration of the state has collapsed and the Chief Minister has lost the confidence of the council of his ministers. The intense haggling continues in the BJP corridors in New Delhi with well wishers of B S Yeddyurappa, Chief Minister of Karantaka telling the party high command that they should give him time till December at least. These loyalists say that in December the Zilla Panchayat polls will be held and the results of the same will be the real test of the Chief Ministers performance. The party leadership has now decided to meet with yeddyurappa who from Puttaparthi will be flying into New Delhi at 4.30 PM today. The core Yeddyurappa group have been requesting Gadkari to give him one more chance and say that it would set a very bad precedent if they drop him on the basis of allegations by the opposition. Moreover they also said that the government will fall in case he is replaced. The issue of a replacement did not crop up during the meeting since they feel that the man cannot be replaced. The stalemate continued in the Karnataka Bharatiya Janata party in Karnataka over the decision to change B S Yeddyurappa as the Chief Minister. Dr V S Acharya, senior cabinet minister in the Karnataka Government who just held a meeting with Nithin Gadkari in New Delhi told rediff.com that it is not easy changing the Chief Minister and he has conveyed the same to the party chief. Acharya said that he has told the high command in clear terms that changing Yeddyurappa will be fatal to the government. Moreover how can a CM be changed on the basis of allegations made by JD(S) leader H D Kumaraswamy. He is not out party leader for the high command to act on the basis of his complaint. I have told Gadkari to review the entire situation once again and then take a decision only after we have given our reply to every allegation. Yeddyurappa continues to be the CM of Karnataka and we hope that it would remain that way. Meanwhile sources in the party said that Gadkari was not impressed and said that the core committee of the party had decided on changing the CM at any cost. Gadkari also explained the pressures on the party if they let the CM continue amidst charges of corruption when they themselves were fighting the Congress on similar charges in the Parliament. However Yeddyurappa may get a fresh lease of life in case the Parliament is adjourned sine die and if this does not happen then Yeddyurappa will have no choice but to go. Will divine blessings help Yeddyurappa ? The mood in the B S Yeddyurappa camp does not look upbeat and appears to be giving up the fight to retain the post of Chief Minister. Yeddyurappa who left for Puttaparthi to seek the blessings of God man, Sathya Sai Baba has clearly indicated to the high command that he would want either Dr V S Acharya or Sadananda Gowda to succeed him in case he is asked to give up the post of CM. 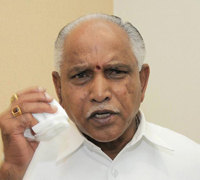 Sources in the BJP told rediff.com that Yeddyurappa will leave for New Delhi from Puttaparthi and have a last round of talks with the high command. Apart from seeking the ouster of the Reddy brothers from the government, Yeddyurappa is adamant that he would want either Dr Acharya or Gowda to replace him. Dr Acharya is a cabinet minister in the BJP government while Gowda is the former chief of the Karnataka BJP. Dr Acharya who is in Delhi to meet with national BJP chief Nithin Gadkari told rediff.com that he is yet to hold talks and he was there to convey the message of the Chief Minister. He however refused to comment on whether he would take over the post of CM and said that it was the high command to decide on the same. Karnataka Chief Minister B S Yeddyurappa has sent his trusted cabinet minister Dr. V S Acharya to New Delhi to pacify the high command not to remove him. He has also told Acharya to convey to the high command that he would step down only if they remove other corrupt ministers from the cabinet. Apart from seeking the removal of the Reddy brothers from the cabinet, Yeddyurappa also wants an assurance from the central leadership that Ananth Kumar should be kept away from the politics of the state. The deadlock however continued with the CM refusing to step down. 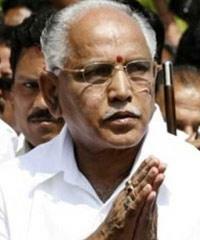 The high command is however adamant that Yeddyurappa steps down before the Parliament commences today. The party has also authorised BJP chief Nithin Gadkari to take a final call on the matter today. The BJP high command has issued an ultimatum to Karnataka Chief Minister B S Yeddyurappa to put in his papers by 10 am today, according to sources in the party. The high command has indicated to the CM that he will need to step down before the Parliament commences today where the BJP is seeking stringent action in the 2G scam. Yeddyurappa however appaears not to have heeded to this ultimatum and continues to send feelers to the high command to give him another chance. Some of his supoorters in New Delhi continue to coax BJP chief Nithin Gadkari to give the CM another chance. The high command however has said that he will have to go and would be reinstated once his name is cleared in the land scam. In any event of the CM stepping down he would have certain conditions which the high command will have to abide by. He would want to chose his sucessor and would also want the. He would also seek an assurance in writing that he is reinstated once he is cleared of corruption charges. Author Vicky NanjappaPosted on November 23, 2010 November 23, 2010 Categories Karnataka Politics30 Comments on Will the stalemate end today? The first Bharatiya Janata Party government in south India is in disarray yet again. This time Chief Minister B S Yeddyurappa will have to prove his majority on October 12 with 21 MLAs tendering their resignation before the government and bringing the numbers down to 96 when the magic figure is 113. In the past two years since the BJP came to power it has faced five major crisis and at least on three occasions it appeared as though the government would fall. Let us take a look at the five different crisis that this government has faced since it came to power in Karnataka. The Reddy trouble: Prior to the existing crisis, this was the biggest set back that Yeddyurappa had once he took over as the Chief Minister. Towards the later part of October 2009, the Reddy brothers started meeting with the BJP MLAs who had a grouse against the CM. The Reddys comprising,Karunakara Reddy, Janardhana Reddy, Somashekara Reddy and their family friend Shriramulu claimed that they had the support of 50 BJP MLAs and would bring the government down. The problem started with a housing scheme in Bellary which were to be constructed for flood affected victims. When the CM said that all such programmes had to be government sponsored and no such work can be carried out individually, the Reddy brothers were quick to react. A cold war broke out between the two camps and the Reddys put out a list of grievances. The first was to sack Shobha Karandlage, a close aide of the CM. They also demanded the head of V Baligar who was principle secretary to the CM stating that he was acting like a proxy CM. The matter reached Delhi and the Reddys got even more aggressive in their claim and started demanding for the head of the CM. However a compromise formula was arrived and Yeddyurappa announced in tears before the media that he had ahdered to their demands. Justice Hegde’s resignation: The boat had sailed on peacefully for nearly a year before Lokayukta Justice N Santosh Hegde tendered his resignation claiming that he was unable to work independently. He alleged that the government had reinstated corrupt officials despite them being pulled up for corrupt practises. He also said that the government had not given him suo motu powers as was promised. Further he also accused them of sheilding some members of the mining lobby and said he was unable to probe the matter independently. This resignation came as a major embarassment for the government since it gave the picture that it was protecting the corrupt. Several other political parties in Karnataka especially the Congress used this as a plank to embarrass the government. However after a week of remaining adamant, the high command headed by L K Advani stepped in and convinced Justice Hegde to take back his resignation. The CM promised action and acted on it. However the suo motu powers to try ministers has not been given as yet. The Mining scandal: This particular epsiode disrupted the Karnataka Legislative Assembly for nearly two weeks. MLAs from the opposition sat in dharna and even slept over at the assembly. The entire issue commenced with the Chief Minister himself declaring before the assembly that several thousand crores worth of iron ore had been exported illegally. This was seen as a tactical move by the CM who wanted pressure building up on the Reddy brothers since it was expected that the entire nation would gun for their throat. The gamble paid off and the Reddy brothers eventually softened their stand against the CM, but the cold war continues till date. However things started getting out of hand and the opposition demanded a CBI probe and the centre was closely monitoring the situation. The government in the state was however adamant and said that a Lokayukta probe would be sufficient and there is no need to rope in the CBI. The focus then shifted to the streets with the Congress taking out a padayatra to Bellary which was again countered by the Reddy brothers who conducted their own rally headed by Sushma Swaraj in their defence. The reshuffle crisis: After the mining scam and the softening of the Reddy brothers, Yeddyurappa announced that he would go in for a reshuffle. Many political pundits saw this as a move solely to bring Shobha back into the cabinet. However Yeddyurappa denied all such allegations and went ahead and brought Shobha back into the cabinet. In the bargain he left out independent candidates who had helped him form the government. One of the ministers, G Shekhar even threatened to commit suicide if dropped from the cabinet. However Yeddyurappa went ahead and dropped him. The disgruntled ministers did issue a couple of statements initially and even had the support of the Reddy brothers who threatened to take the matter to the high command. However this issue fizzled out and the government was back on track. Reshuffle extended: The latest crisis is nothing but an extention of the earlier one. The MLAs who have been left out of the cabinet have joined hands and threatened to bring down the government. Around 20 of them are presently camping in Chennai and are threatening to bring down the government. 21 MLAs have even tendered their resignations to the Governor which in turn has made the latter decide to direct the government to prove its majority on the floor of the house. Even as Yeddyurappa continues to send emissaries to Chennai after assuring the rebels of a good deal, it would still be an acid test for him since he will have to prove his majority on October 12. The face-off within the Karnataka judiciary just got murkier with the registrar general moving the Supreme Court of India seeking a gag order on one of its judges, who had allegedly passed remarks on assignment of judicial matters. While the apex court will take up the matter later on Tuesday, various senior advocates in Karnataka have been upset with the recent turn of events and have asked judges to stop expressing their grievances in public. State Advocate General Ashok Harnahalli said this washing of dirty linen in public is regrettable and is adversely affecting the image of the institution. “The entire controversy has arisen only because one of the judges in the high court had a problem with some matters not being placed before him. One must understand that the chief justice of any court is the Master of the Roster and it is he who decides as to who any matter goes before,” he said. “In the case of Karnataka, however, the institution has been left headless in the wake of Chief Justice P D Dinakaran being asked not to take up matters due to an ongoing controversy against him. It is unfortunate to say that the Supreme Court or the government of India has not acted upon this matter and posted a functioning chief justice,” he added. Uday Holla, a senior counsel who is representing the registrar general of Karnataka high court in this case at the Supreme Court, said the image of the institution has suffered a great deal. Justice Santosh Hegde, former Supreme Court judge, said the Karnataka high court was being dragged into the muck for the past six months. “Under the guise of fulfilling their egos, these judges are ruining the name of the high court. The Supreme Court will have a huge role to play in this matter. Putte Gowda, president of the Bangalore Advocates Association who had passed the resolution that Justice Dinakaran would not hear matters until he was cleared, said the apex court better take a decision to maintain the dignity of the institution.